Air ambulance services in the United Kingdom are provided by a mixture of organisations, operating either helicopters or fixed-wing aircraft to respond to medical emergencies, and transport patients to, from, or between points of definitive care. These air ambulances fulfil both emergency medical services functions, as well as patient transport between specialist centres, or as part of a repatriation operation. The first air ambulance services in the UK commenced in Scotland in November 1933 with a flight from Wideford Airport, Kirkwall Orkney and in February 1939 the first night time ambulance flight was undertaken from Wideford to the island of Sanday, using car headlights to help take off and landing. The aircraft used was a General Aircraft Monospar G-ACEW operated by Highland Airways. Emergency air ambulances are generally helicopter based, and used to respond to medical emergencies in support of local ambulance services. In England and Wales, all of these services are charitably funded, and operated under contract with a private provider. The ambulance staff crewing these flights are generally seconded from the local NHS ambulance service. In Scotland, there is the only publicly funded air ambulance service, with the Scottish Ambulance Service operating two helicopters and two fixed wing aircraft in this role, alongside a single charity helicopter (EC135T2), operated by Scotland's Charity Air Ambulance. 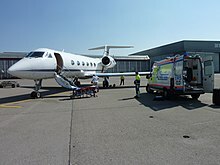 There are also a number of patient transport operations in the UK, generally using fixed wing aircraft, and which are part of a system of moving patients between points of care, or as part of a repatriation to the UK. There is a helicopter based patient transfer service, focused on paediatric cases, called the Children's Air Ambulance, which first flew in 2012. The Scottish Ambulance Service operates two fixed wing aircraft in this role, and there is a similar service provided under contract in Northern Ireland, with patients flown to the mainland UK for treatment. In 2015 the neonatal, paediatric and adult emergency care and retrieval operations were brought together with the Scottish Ambulance Service and utilise the aircraft and road ambulances for this purpose. They are co-located at the Scottish Ambulance Air Base at Glasgow International Airport. There are also a number of private providers offering transport by fixed wing aircraft. In 2012, the Children's Air Ambulance was launched, providing a national service for the transport of paediatric patients to specialist centres. In 2017, G-HEMZ was retasked to emergency HEMS operations with the Warwickshire and Northamptonshire Air Ambulance and replaced with 2 brand new AgustaWestland AW169 helicopters - registered G-TCAA and G-PICU. On 19 May 1996, a Britten-Norman Islander aircraft operated by Loganair for the Scottish Ambulance Service crashed short of the runway at Lerwick/Tingwall Airport in Shetland while turning to final approach at night during strong and gusting winds. The pilot was killed, and the physician and flight nurse were injured. There was no patient on board at the time. On 26 July 1998, the three man crew of the Kent Air Ambulance died when the aircraft collided with power lines and crashed in a field in Burham, near Rochester Airport. Initial investigation established no definitive cause for the crash, due to the fireball produced on impact. Controversy ensued when the pilot's employers, Police Aviation Services, denied liability. On 19 February 2004, following a civil case brought by the pilot's widow to the High Court in Manchester, it ruled that the crash was caused by mechanical failure, not as suggested flying low for fun, and ordered compensation to be paid. On 14 June 2000, four passengers and one pilot were killed when a Piper PA-31-350 Navajo Chieftain, chartered for a medical transfer from the Isle of Man, crashed on approach to Liverpool Airport. On 15 March 2005, a Britten-Norman Islander aircraft operated by Loganair crashed into the sea while descending toward Campbeltown Airport in western Scotland. The aircraft was operating an air ambulance flight on behalf of the Scottish Ambulance Service. The pilot and paramedic both died in the crash. ^ "Amazing Facts about your Air Ambulance". Association of Air Ambulances. Retrieved 26 July 2009. ^ "The Children's Air Ambulance". Express and Echo. 18 December 2012. ^ "New air ambulance for NI after flight ordeal". BBC news. ^ Air Accidents Investigation Branch. "BN2A-26 Islander, G-BEDZ, 19 May 1996". GOV.UK. Department for Transport, Air Accidents Investigation Branch. Retrieved 31 December 2015. ^ "AAIB Bulletin No: 2/2000" (PDF). Air Accidents Investigation Branch. Archived from the original (PDF) on 16 March 2009. Retrieved 5 July 2009. ^ "Air ambulance crash pilot cleared". BBC News. 19 February 2004. ^ "Piper PA-31-350, G-BMBC" (PDF). AAIB. Retrieved 27 July 2013. ^ "Air crew search called off". BBC News. 15 March 2005.